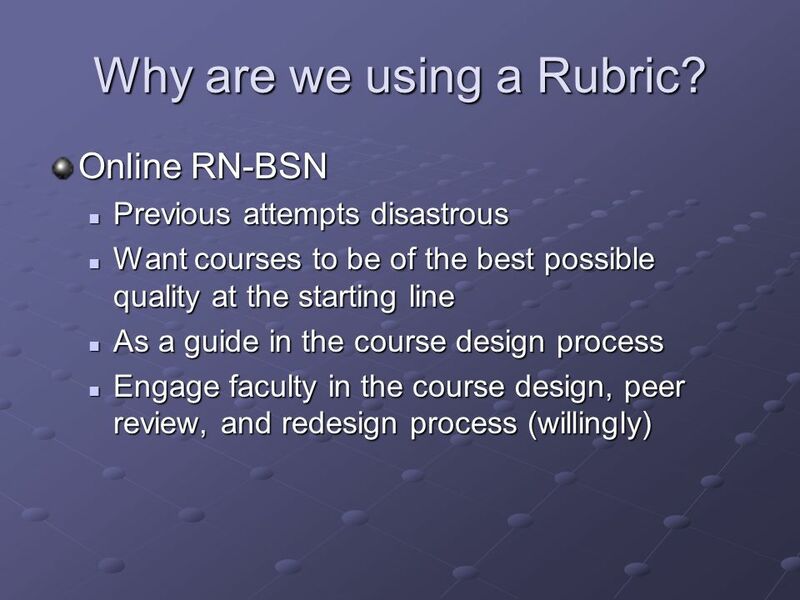 Using a Quality Evaluation Rubric in Online Course Development Eli Collins-Brown, EdD Methodist College of Nursing Peoria, IL. 3 Whos Here? 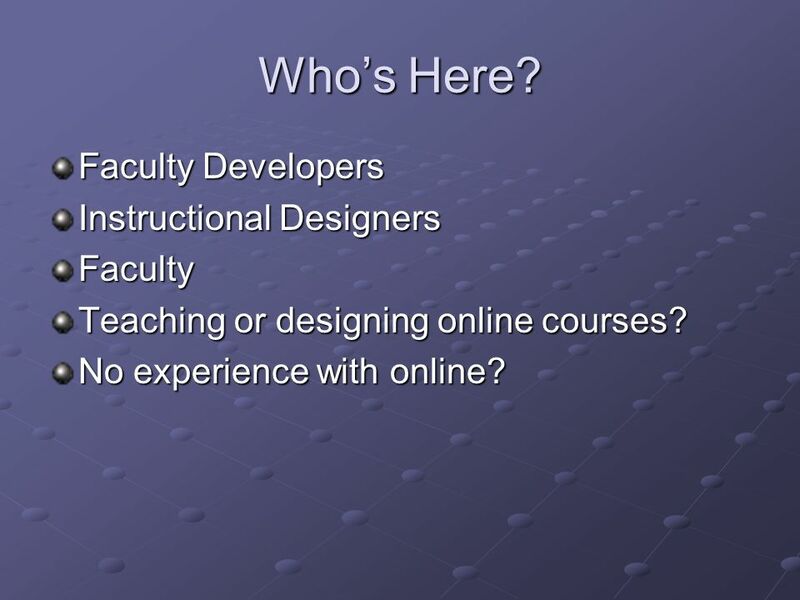 Faculty Developers Instructional Designers Faculty Teaching or designing online courses? No experience with online? 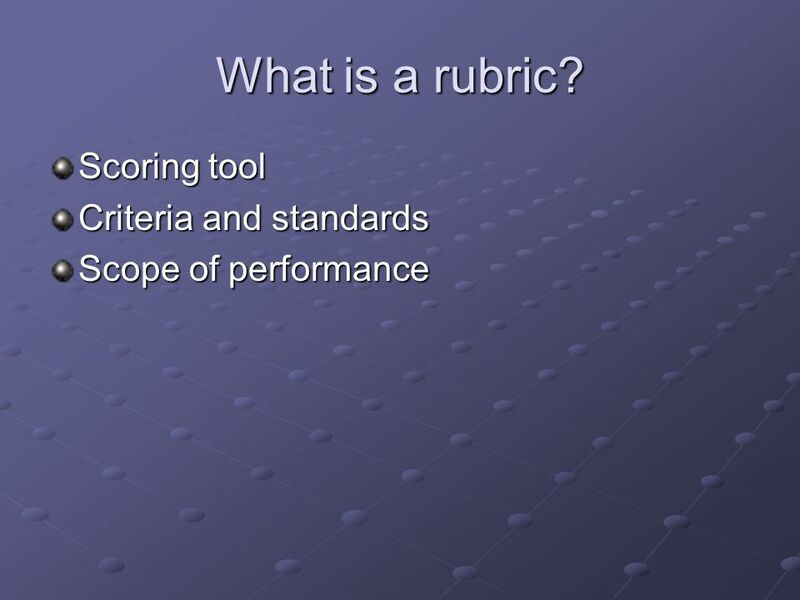 13 Questions for Discussion What are the benefits of using a rubric? What are the drawbacks? 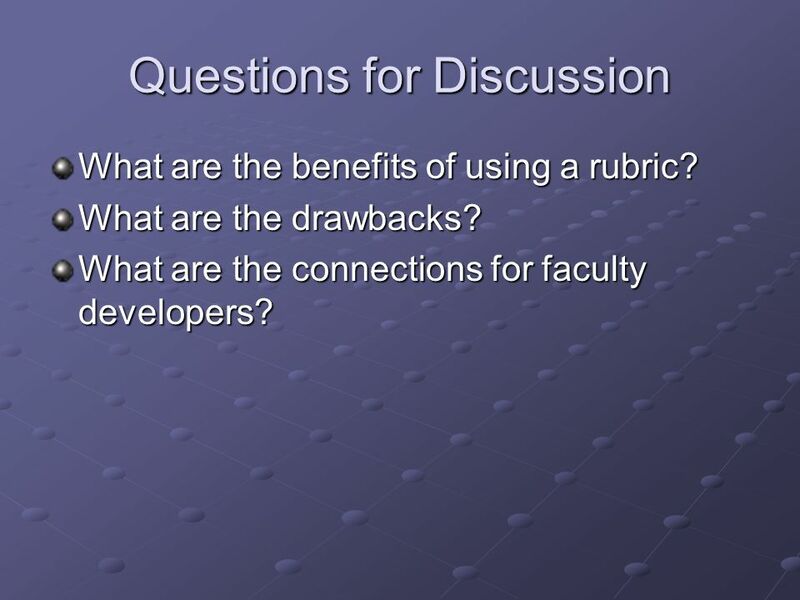 What are the connections for faculty developers? 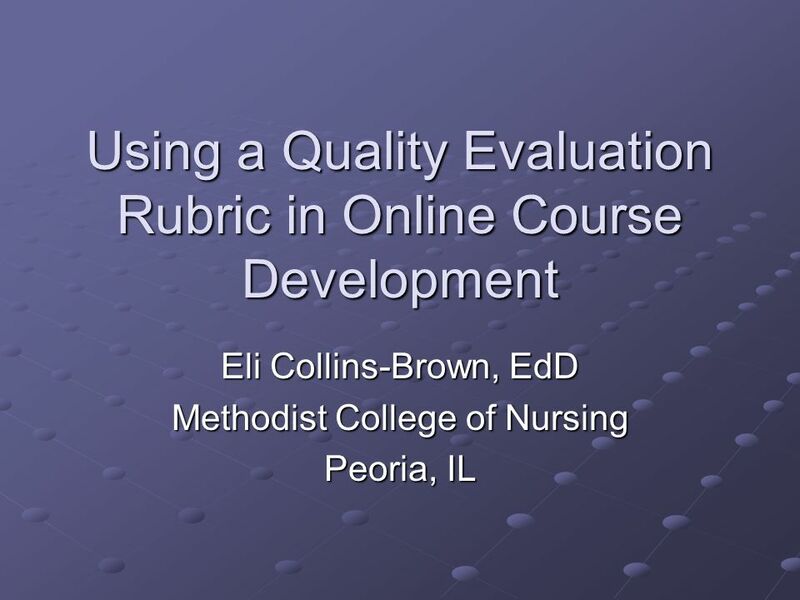 Download ppt "Using a Quality Evaluation Rubric in Online Course Development Eli Collins-Brown, EdD Methodist College of Nursing Peoria, IL." 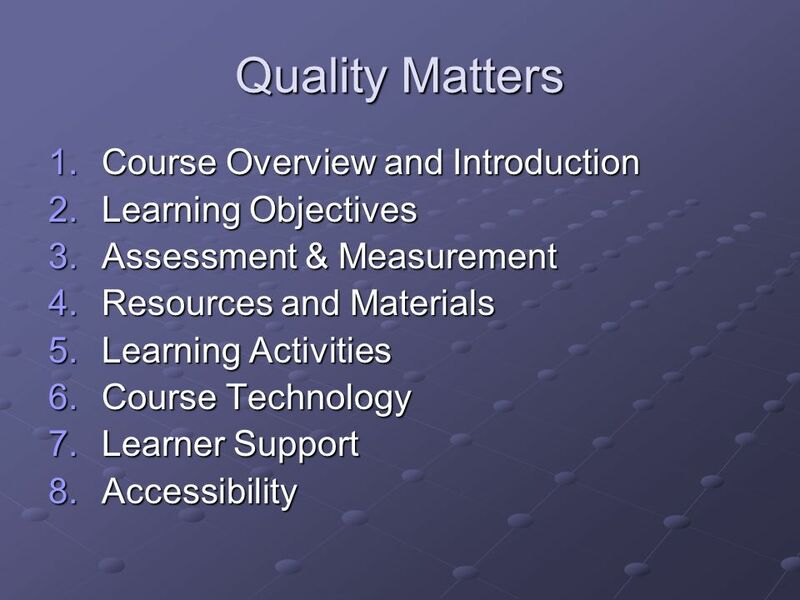 Quality Matters Building a Quality Online Course. By M. Johnson Synopsis Needs Assessment Plan Course Goals Terminal Objectives Prerequisites Instructional Plan Evaluation Plan. 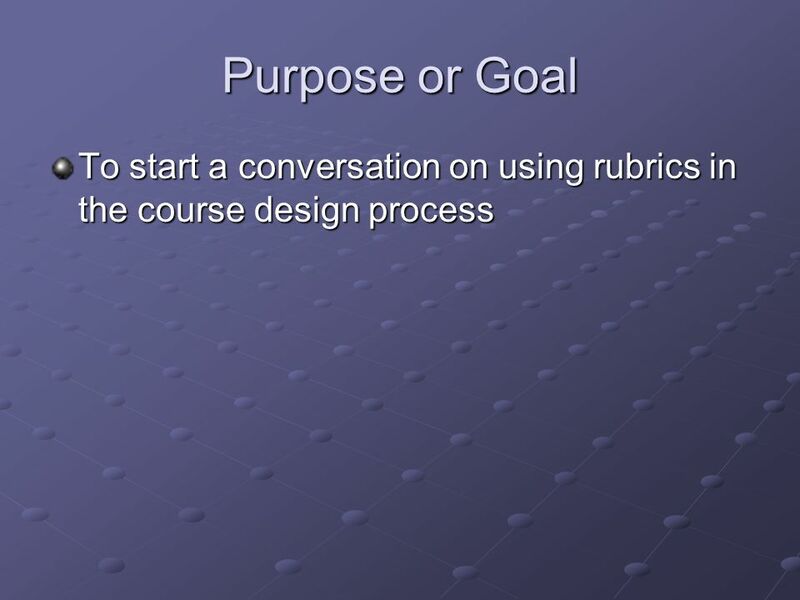 Using Course Evaluation Rubrics in the Online Course Design Process Eli Collins-Brown, EdD Methodist College of Nursing Peoria, IL. 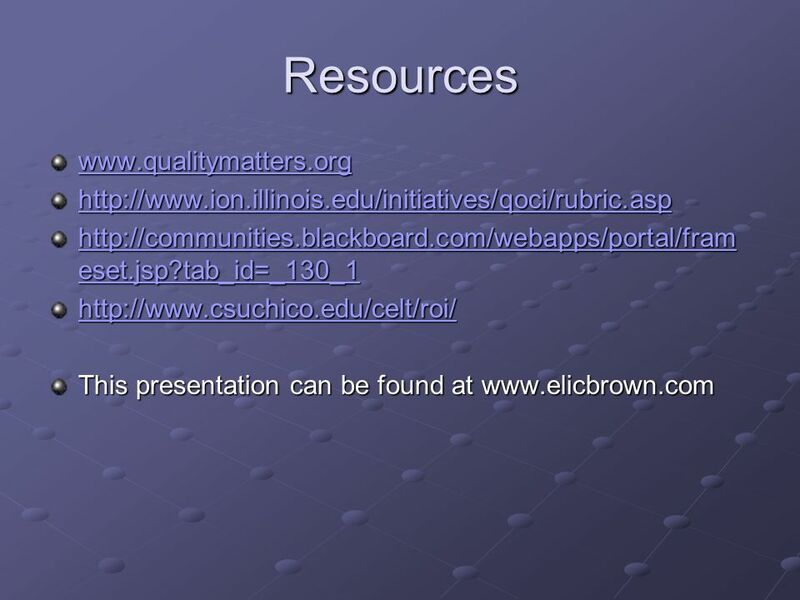 One Minute Papers and Blackboard: An Unbeatable Team for Formative Assessments Eli Collins-Brown, EdD 5 th Annual SLATE Conference Chicago……October 2007. Eli Collins-Brown, EdD Jill Pegg, MS, RN. Google Docs Application Objectives: Define wiki program Explore the different types of wiki programs Share how. Week 6: Differentiated instruction, engaged learning, teaching for understanding, community of inquiry. 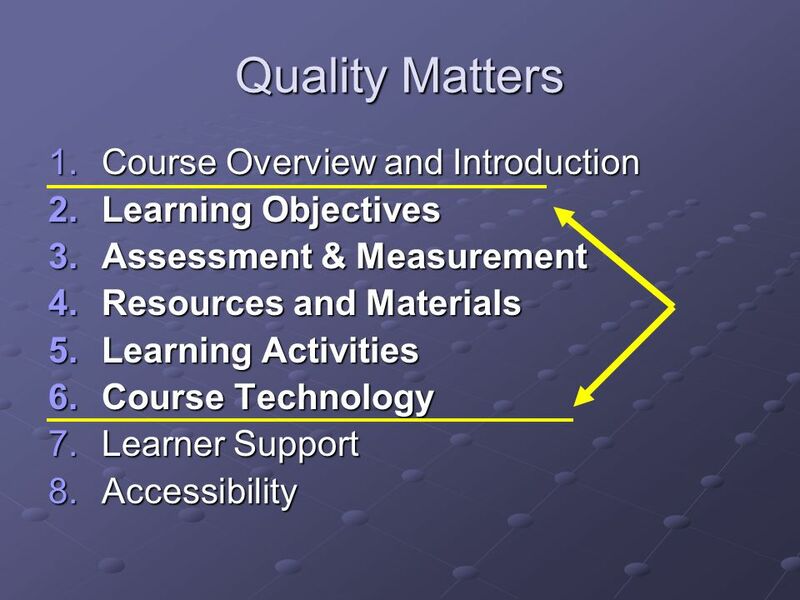 Assessing the Quality of Online Courses Rayane Fayed Instructional Designer American University of Beirut June 2013. 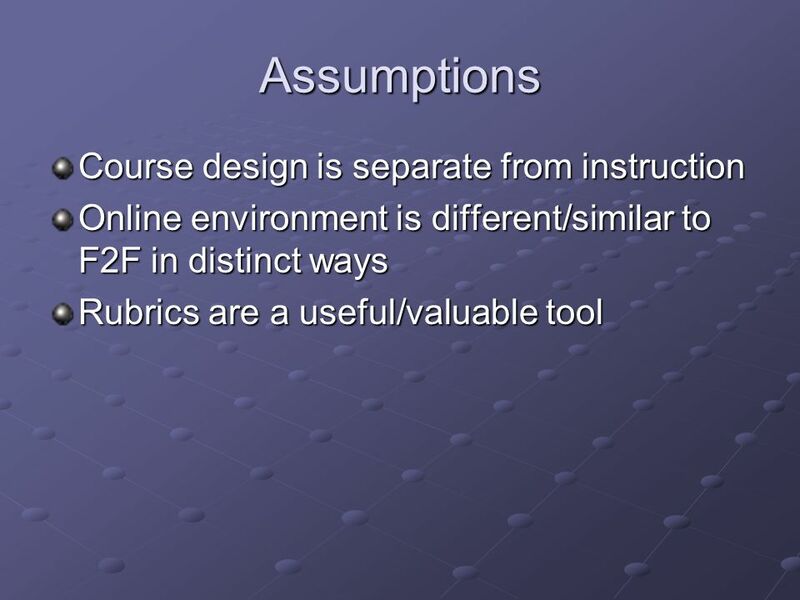 Course Selected Institutions decide to examine an online or hybrid course as part of a peer review. Since institutions make a significant investment in. Where do I Begin? 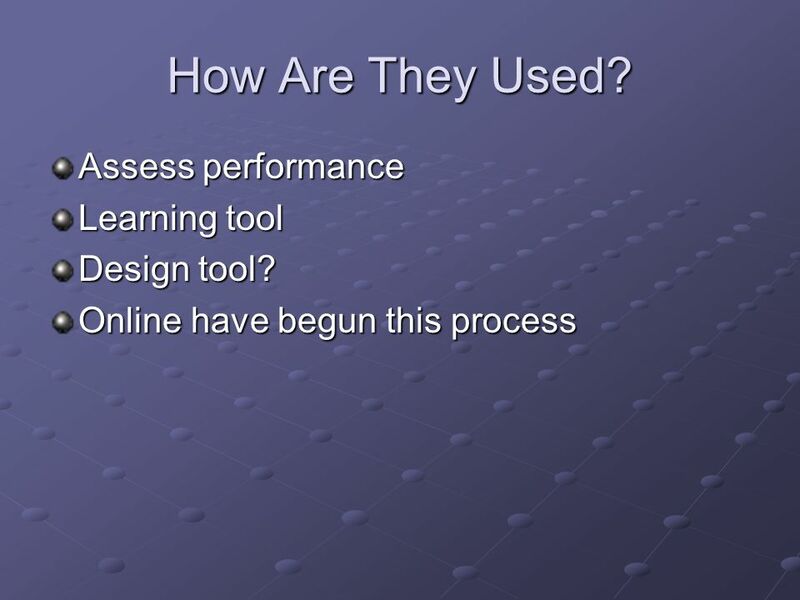 Basic Course Development for Online Learning. What is it? What is it? 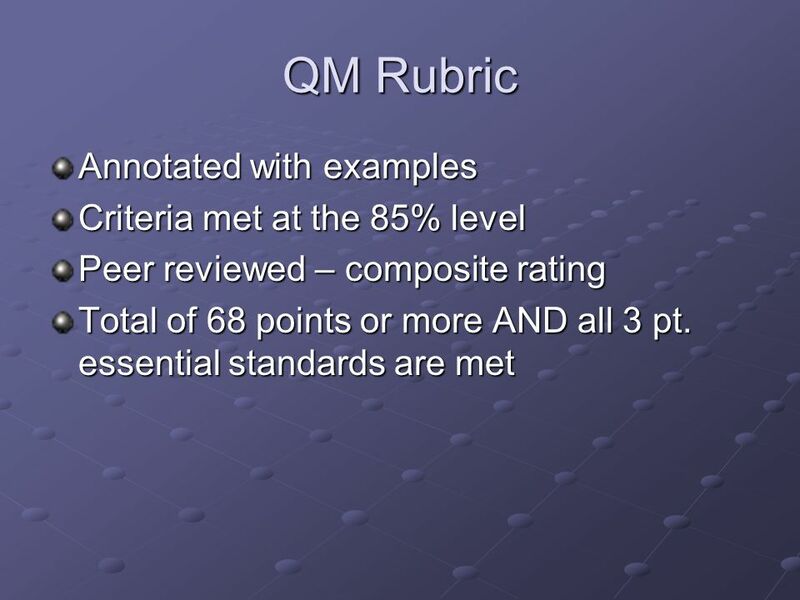 Quality Matters (QM) is a nationally recognized, faculty- centered, peer review process designed to certify the quality of online. 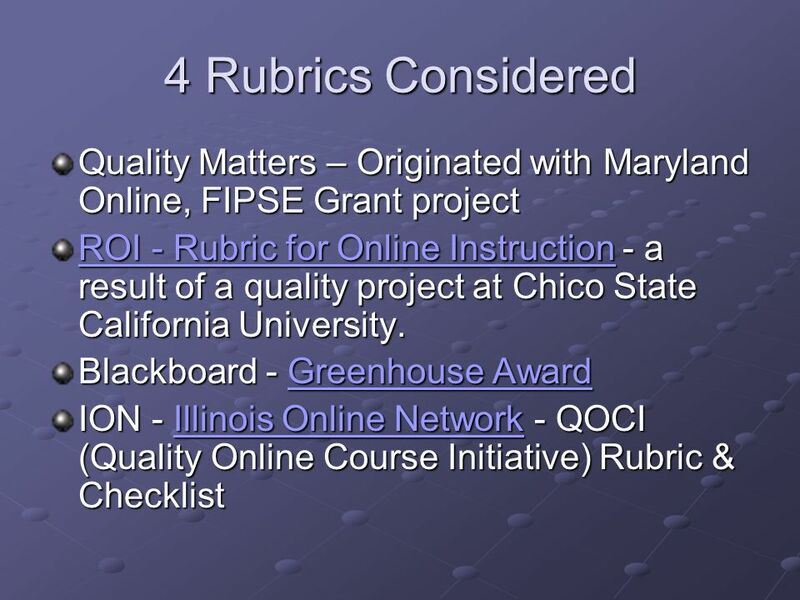 The Quality Matters Rubric ® ©MarylandOnline, Inc All rights reserved. Getting Started with Quality Matters TM ©MarylandOnline, Inc All rights reserved.